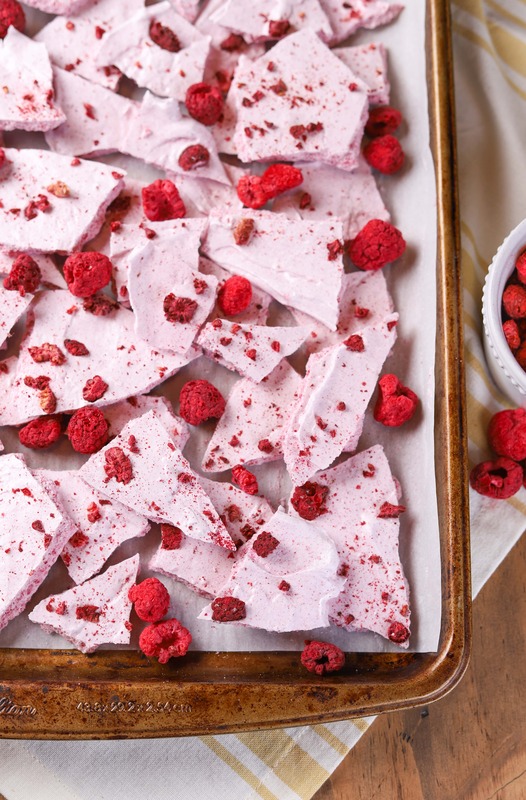 This light, airy Raspberry Meringue Bark is a fun, melt-in-your-mouth treat that is super easy to make! No piping individual meringues, just spread it on a cookie sheet and bake! After a winter full of comfort food, I find myself craving light, fresh foods when spring rolls around! We’ve been eating all kinds of fresh fruits and vegetables lately in an attempt to satisfy that craving. And while there still may be snow on the ground (with more on the way), I’m ready to make all things spring in our kitchen! 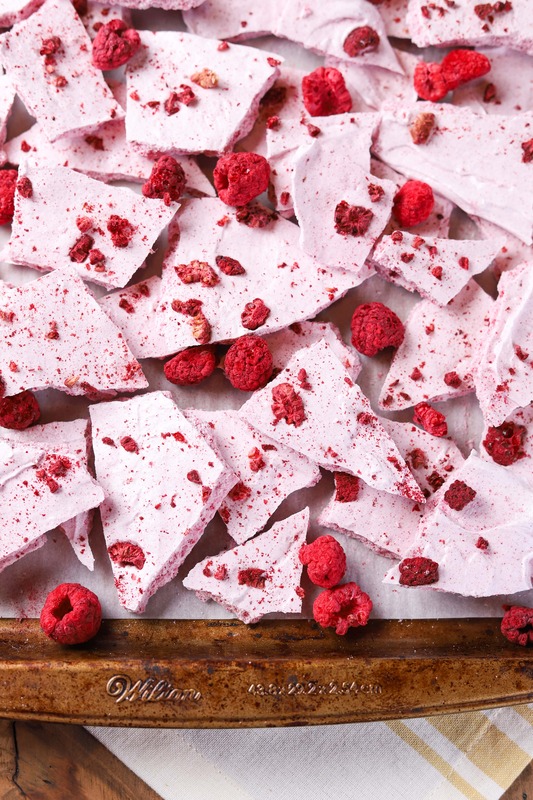 This raspberry meringue bark was one of those recipes that came out of our kitchen recently. Light and airy, this melt-in-your-mouth meringue bark is the perfect sweet treat to enjoy without feeling like you’ve eaten a heavy dessert. I was initially going to make a raspberry variation of these lemon meringue kiss cookies. However, I remembered how I took the last of meringue in the piping bag, spread it on a baking sheet, and baked it. The lemon meringue turned out great baked in a sheet. So, I figured I would try to make an entire batch that way! It’s so much easier than piping individual meringues. And while they might not look as cute as little meringue kisses, this meringue bark is so much easier to make that every now and then it’s okay to forgo the “cute” factor for easiness! Plus, I’ve found that the meringue is more forgiving when you are just spreading it into a pan and baking it. If you don’t beat the egg whites quite long enough, you can still end up with a crunchy meringue. You also don’t have to worry about it holding shape like when you pipe it! 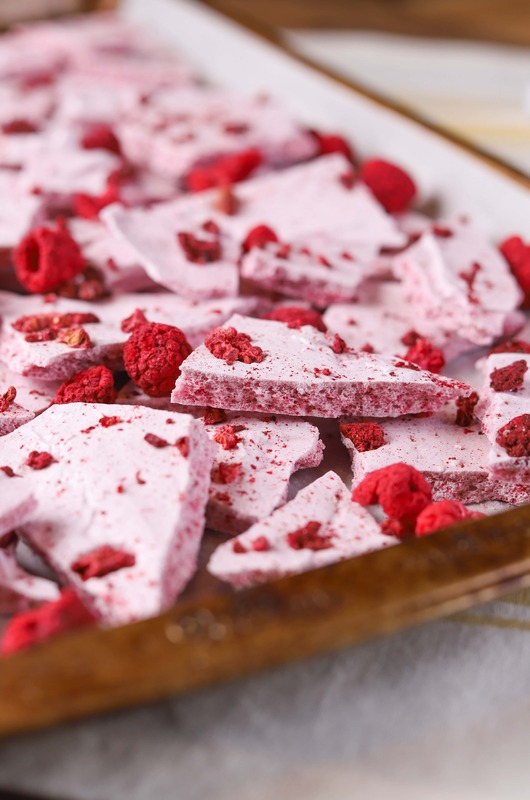 The tartness of the freeze-dried raspberries balances with the sweetness of the meringue and makes the meringue just addicting enough that you find yourself grabbing a piece out of the container every time you walk by it! Perfect for spring after a winter full of comfort food! Preheat oven to 200 degrees. Line a baking sheet with parchment paper or a silicone baking mat. In the bowl of a stand mixer affixed with a whisk attachment, add the egg whites. Beat on medium-low until foamy. Add cream of tartar and salt. Continue beating on medium speed and slowly sprinkle in sugar. Do not add sugar too quickly. It should take a few minutes to incorporate all of the sugar. Turn speed to high, and continue to beat eggs until thick and glossy and stiff peaks form. 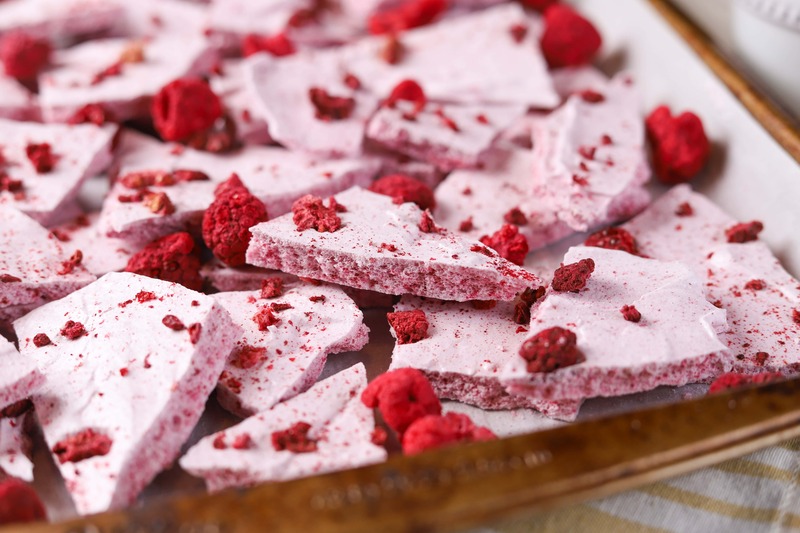 Gently fold in crushed freeze-dried raspberries and vanilla extract with a spatula until just combined. Do not over stir. Carefully spread meringue onto prepared baking sheet, about ¼ inch thick. Sprinkle with coarsely crushed raspberries. Bake for about 2 hours or until hardened and no longer soft and sticky. Remove from oven and allow to cool completely. Break into pieces, and store in an airtight container. Love the composition ! Really beautiful ! Thank you !